Born in a family of musicians, being the son of noted vocalist of yesteryear Shrimatibai Narvekar of Agra Gharana, Surendra Narvekar had natural inclination and appreciation towards Indian Classical Music and thus developed his musical sense from childhood. Then as a student of Kinnara music School started by Pandit Ravi Shankar in Bombay, he learnt Sitar from 'Pandit Shankar Ghosh which enabled him to study various Ragas with their systematic approach based on the well conceived notation system and impressive unfoldment. 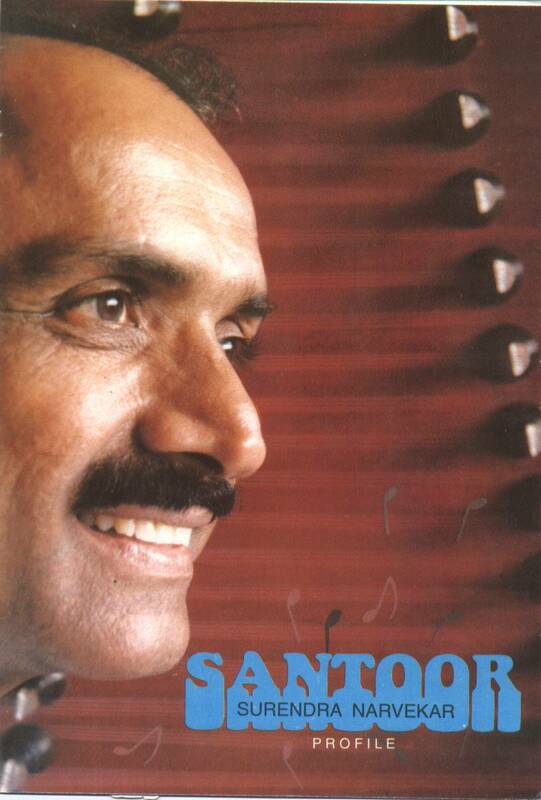 Later, Surendra took up to Santoor under initial guidance of Shri' Walmik Dhande and to his own satisfaction, he found it to be most suited to his temperament, his mode of thinking and _expression. He has been fortunate enough to be blessed by Pandit Shivkumar Sharma as his disciple from whom he has been receiving training and guidance to master the intricate Laya oriented 'Chaand' and other complex styles of presentation. His association with Guruji has helped him to broaden his outlook and perform impressively. He is an Architect by profession and has devoted himself to this performing art. He has performed in many concerts, and has the privilege of giving a major maiden performance in Nagpur, in Mehfil's Annual Music. Conference in 1993 which was very well received by music lovers as well as music critics. In 1994, his performances in the prestigious National Centre, for Performing Arts 'Bombay and again in "Mehfil's Annual Conference in Nagpur, were also well received by the connoisseurs. 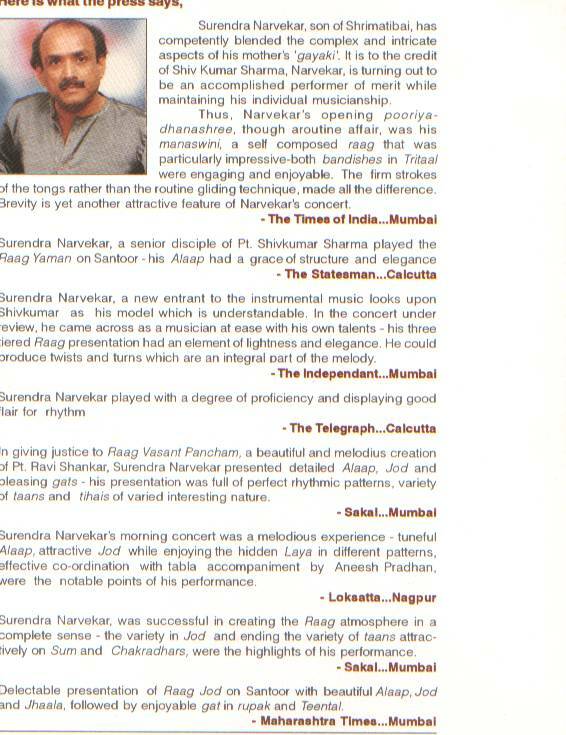 His recent performances in conferences conducted by famous Halim Academy of Sitar, Sangeet Research Academy, Sureshbabu Mane - Hirabai Badodekar Smriti Samaroha in Vile parle, Mumbai as well as by music organizations like Rageshwaree, Maharashtra Lalit Kala Nidhi, ShivSangeetanjali, Kala Ghar in Mumbai, Deval Club in Kolhapur etc. and Dr. Balaji Tambe's atmasantutan 'Kendra at Karla Lonavala, were also a stunning success. Shyam Kane is a senior disciple of tabla wizard Ustad Zakir Hussain under his tutelage for the past 25 years. He also taught tabla in the famed Ali Akbar school of music in California. He has accompanied many renowned artists with brilliance and spontaneous improvisations.